Join us at Chamberlains Quality Fish & Chips (on the junction of Hagley Road West and Wolverhampton Road) for our Coffee Morning and Fish & Chips day on Friday 28th September from 10am until 9pm. Take part in the Worlds Largest Coffee Morning and support Macmillan Cancer by joining us at some point throughout the day. There will be a raffle, tombola and lots of great food, we also hope to have a few local celebrities popping in during the day to show their support. Anyone wishing to donate a prize should bring it along to Chamberlains or to pledge a prize eg a service or gift from your business or place of work please email chamberlains.fishandchips@hotmail.co.uk. We are hoping to raise several hundreds of pounds for this worthwhile cause and hope we can count on your support. I’ll be there with some gifts for the raffle and tombola – looking forward to it! 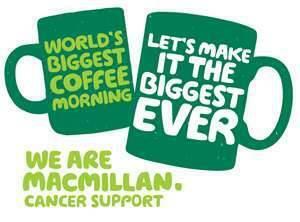 The Bear are also running a Macmillan Coffee Morning for those of you that side of the woods.